Manufactured homes in Central Florida have been a popular purchase for adults 55 and older who want to retire to the Sunshine State but need to be mindful of budget concerns. Bear Creek, a 55+ community near Florida’s Atlantic Coast, offers beautiful manufactured homes with an added benefit – they’re situated within a resort-style active adult community loaded with amenities. The beautiful, wooded surroundings at Bear Creek are dotted with a number of homes available for purchase. Many of these well-built residences have been remodeled to include updated cabinetry, stone countertops, newer appliances, easy-to-maintain flooring, and other conveniences. The exteriors of these homes are outfitted with vinyl siding and windows, so you can spend less time worrying about chores and enjoying Florida’s 300+ days of sunshine each year. 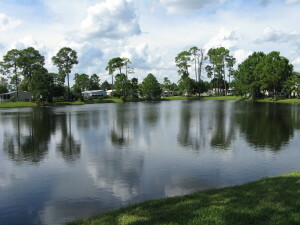 As if that wasn’t enough, residents of Bear Creek can also take full advantage of our location in Central FL. With just a brief drive outside the confines of our community, you’ll enjoy access to white-sand beaches, the Kennedy Space Center, the theme parks in the Orlando area, and other attractions at Daytona Beach. There are many words that can be used to describe life at Bear Creek – “dull” is not one of them. To learn more about our manufactured homes, or to schedule a visit to our community in Central FL, contact one of the friendly Lifestyle Consultants at Bear Creek today.